Throughout centuries, flowers have occupied a vital role in our lives. They have been the most suitable gift for every single occasion, happy or sad. Flowers are used to expressing gratitude and pay condolences such as weddings, birthdays, anniversaries, funerals, art gallery openings, romantic dinners, business meetings etc… they can do it all! So getting yourself a flower nail design can never be a wrong idea. When we hear the word “flower“, a million images of many types of flowers pop into our minds invading it with infinite colors and options to choose from ranging from tiny cherry blossom flowers to orchids, sunflowers and much more. Consequently, there are infinite flower nail designs you can pick from but what are the finest? Here is a list of the top 25 coolest flower themed nails you could ever find. Unravel your inner artists and use this impressionist style to blow off everybody’s mind with this endless colorful frenzy! Polka dots are cute and easy to apply. Try a manicure inspired by anything around you, even table cloths and old tea cup sets can do the trick. Polka dots combined with a floral effect is indeed a great idea for a flower nail design! Grow your own bouquet and apply slight floral details at the tips and before you know it, it will make the image of an appalling bouquet newly sprout. If you are in a rush but want to get a flower nail style then this one is for you. Apply a few flowers on your favourite finger with different colors while keeping the others plain and simple. Whether you crave them inside, on the tips,center, or all sprawling all over, applying a light coloured base to a strong colored flower collection can always make them stand out! Go beyond flowers by pairing them with lace, stripes, french tips, and small decals to get a cohesive look. Secret keeping, true love, new beginnings, purity, and innocence are what a daisy means. Try this flower nail design and splash some daisies on your nail beds if you want someone to get a hint from all the different meanings of a cute little daisy! We are always told to :”Go big or go home!”. Assign petals as the center of attention in your nail style and draw them in big sizes that spread from tip to tip. Adding pearl decals makes them look more feminine and interesting. When we think about peaceful colors, we automatically think of white or blue. Imagine putting them together? Make up your own peaceful environment right there on your nail beds! The secret to smart elegance and sophistication lies just behind a 3D chic flower nail design. Rhinestones, strass, bows, french tips, glitter varnish, stripes and much more all lead to the road to sophistication! You don’t need to draw whole flowers to imply a great nail design. By simply drawing smooth petals, looping stems or flying leaves, your imagination would lead you to predict the flower’s shape as a whole and stimulate a whole new hypothesis about the way you view this person! If you are in a rush and don’t have much time until you need to head out to meet your girlfriends for shopping but want to flaunt a flower nail design then go ahead and pick your favourite finger to flower-ize and get a glamorous manicure in no time! If you’ve got a steady hand,go Hawaiian and try this flower nail style for a tropical adventure. If you are a girl who likes to live it up every moment then this is the ideal nail theme for you to wear on a stroll at the beach or a scuba diving experience. Seaweed and starfish are all about the nautical style. Your nail beds are your own little sketchbook, add some hatching to the petals and throw in a few stems to make it look realistic on a recessive white base coat that makes it all pop. Nothing screams “Girly & Curly” like this pretty cute flower nail design. For a more feminine perspective give this style a try. Glittery and shimmery with a splash of the sequence can never look better without this freehand needle drag flower nail style. Be creative. Be you! Try scribbling some cute little cherry blossoms on a green base nail polish to send a statement and show that the world looks better in green and it’s time to stop all this pollution madness. 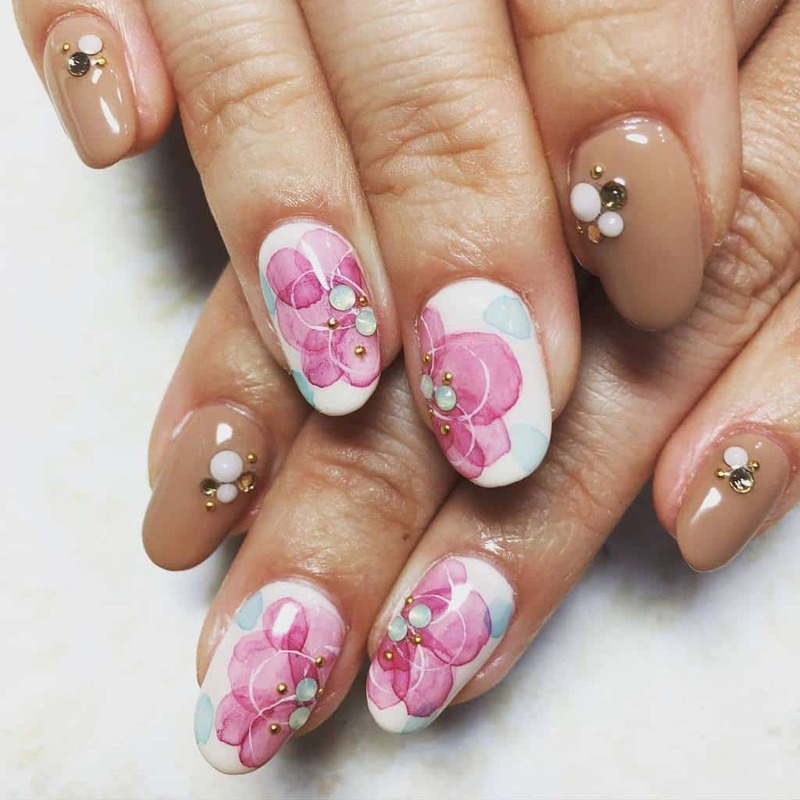 Using different kinds of bubbles and blobs to symbolise flowers on the inner side of your nail beds is a great method to create a pretty nail theme. Keep it clean and simple by applying this simple yet unusual and vivid flower nails that consists of white french tips and paisley printed stickers. New to nail art? Try this easy nail design and keep practicing because you know you are meant to be a true artist! Don’t hesitate and draw the black shadow of the flora you choose to draw to make it pop and seem visually attractive. For all of you girls out there that suffer from the lack of steady hands, try putting on more decals than extremely detailed drawings that are just ready to put on and look on point! Brighten up a white background with mini flowery figures and silver dots . If floral patterns are not enough for you, then go crazy and add a breezy weather effect to make it more vivid and interesting. You are the weather forecaster of your nail beds! Go Ahead and celebrate spring season with these exotic flowers and their looping stems while enjoying your time boasting about your spectacular seasonal look. We only provide you with the best of the best because you deserve it ! Spread your petals and bloom away!